There was a time when the internet was completely text-based. You got it right. No Netflix, no Google, or the things, we are familiar with, nowadays. But today, we are completely dependent on the internet, from meeting new people on Facebook to watching those cute animal videos on YouTube. The internet has come a long way. That being said, I am sure, there are people, who use the internet for time pass, and that makes sense. But when doing Facebook, and watching YouTube videos reduces your productivity, there is a serious need to stop these things, and get back to work. But I know, how difficult it is to forget the comfort of seeing ‘Facebook’ on the browser’s title bar. 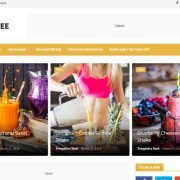 So this article is about a small piece of tool, which can reduce your addiction by stopping you from accessing those alluring websites while you are at work. Yes, it can be pretty handy. Most people nowadays use Google Chrome, and if you are not the one out of the flock, you are in luck. But if you are on a different browser, sadly, I don’t have any solution for your internet addiction right now. Don’t worry, I will come up with a solution for such browsers, as well, soon. I am sure you will thank me later for such an amazing tutorial to save you from those addictive websites. 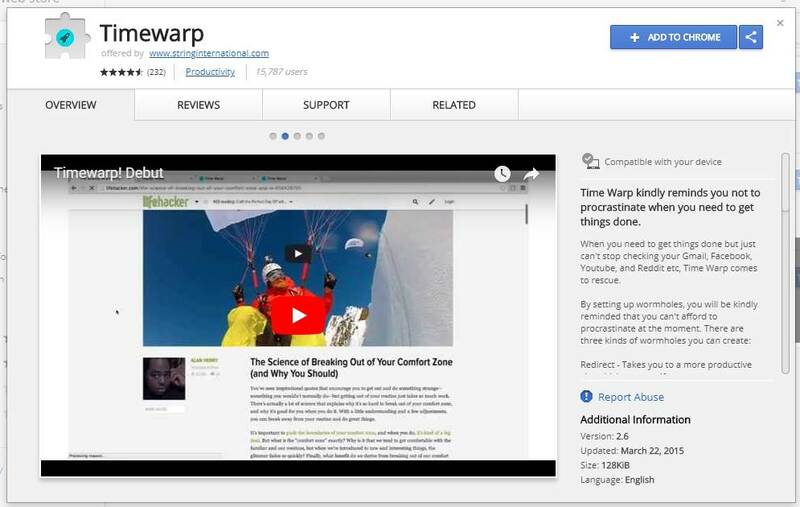 How to stop accessing yourself from the addictive websites using a TimeWarp on Google Chrome, an alternative to Mozilla Firefox plugin Leechblock. The steps to follow for implementing Timewarp alternative to Leechblock for Chrome. 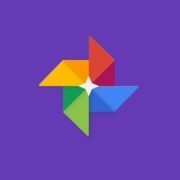 Go to the Chrome Web Store, and download ‘Timewarp’ from it. You can even download it here. A new window will open. Click on the option saying ‘New Wormhole’. It should be present on the top right corner of the tab. Now enter the domain name, which you are addicted to. It can be ‘facebook.com’, ‘twitter.com’, ‘youtube.com’, ‘how2shout.com’, or anything. Oops, not ‘how2shout.com’, or else you will have to bid adieu to such amazing tech topics. Do not include ‘www.’, ‘mail.’ or something before the domain names. Now choose the wormhole type. It basically means, what action will be taken, when you try to visit the website. 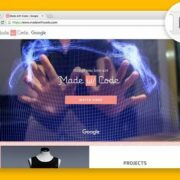 You can either get redirected to a different website, where you should be working on, or something similar to that. 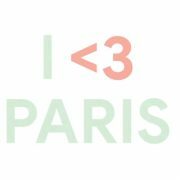 But you should enter the full address of the website. 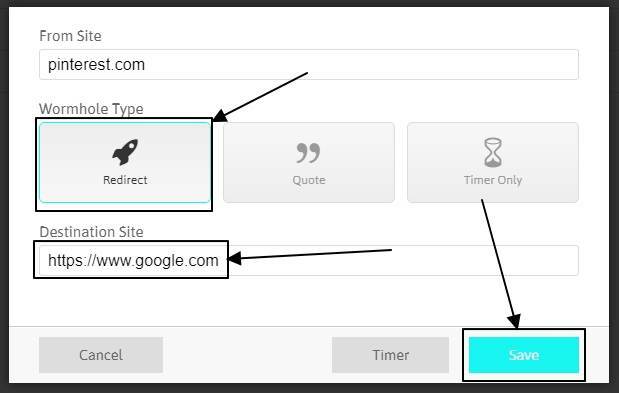 For example, if you want to get redirected to ‘google.com’, you should type the full address, i.e. ‘https://www.google.com/’. You can make the app shown you some motivational quote, to get you back to work. 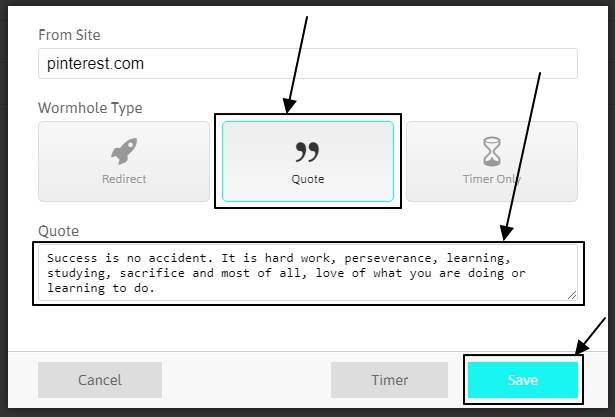 Timewarp does not have a cool library of quotes. So you will have to type your own favorite. Maybe from the last book, you have read. Lastly, you can make the app count the time, you have wasted on a website. 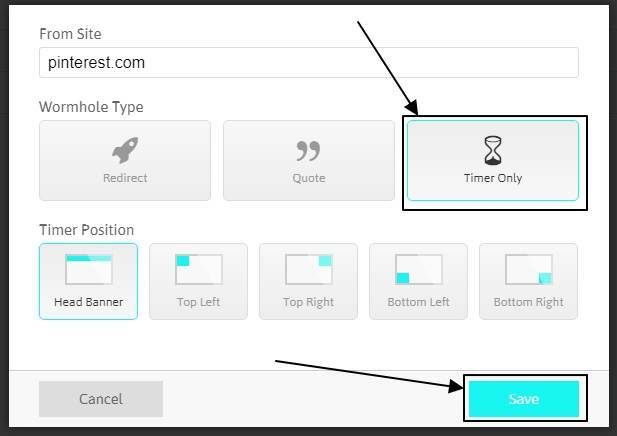 You can make the app show the timer on top of the website, top left, top right, bottom left and bottom right corner of the screen. Once you are done entering all the wormholes, or the websites, which distract you a lot, it is the time to activate Timewarp and find out how it works. Just click on the Timewarp icon, beside the triple-dot menu, to toggle it on or off. When Timewarp is turned on, you will be unable to visit those websites, which are added to the list. To visit those websites again, you will have to turn Timewarp off and enjoy your life on your favorite websites. 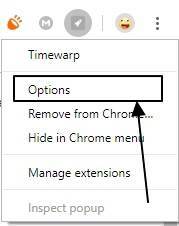 For better results, I will recommend you to hide Timewarp in the Chrome menu. It will add one more step if you have the habit of toggling it on or off frequently. 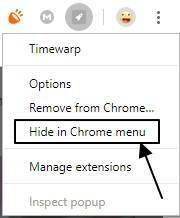 Just right-click on Timewarp, and click on ‘Hide in Chrome menu’ to make it appear invisible. Your work-life and personal life on the internet can be sorted with this great piece of app. The only thing, which you should be able to control now, is to stop toggling Timewarp on and off repeatedly. Once you can master that, you might be the next most productive guy in your office. Yes, nobody can say the future. Hope the small information on how to block addictive websites on the internet was helpful for you. Have any questions? Feel free to comment it down below.